Recently, our small group from church read Thriving in Babylon together. Thriving is a book about how to live as believers in Jesus Christ in the midst of a culture that is increasingly hostile to God-centered truth. Osborne, a fellow EFCA pastor, has a different take on these matters than what we typically hear from many Bible-believing preachers. He focuses on the life of Daniel and brings out parts of Daniel's story that emphasize hope, humility, and wisdom. I appreciated Osborne's fresh reading of Scripture and his call for believers to not live in fear or hate. Because he was trying to correct imbalance, he probably unbalanced a few things that I would have nuanced differently. For example, he went to great lengths to show that Daniel wasn't afraid to compromise because he had hope, humility, and wisdom. And that's true--amazingly Daniel didn't object to his training, his name change, or the ungodly behaviors of the people around him. On the other hand, Daniel did make unflinching choices at times, as well. He got thrown in to a lion's den for it! I would have loved some more teaching on when and how to be unbending, too. But on the whole, it was a breath of fresh air in a time of great uncertainty about how Christians are supposed to live. I googled for a small group discussion guide several times and couldn't find one, so I created my own for our group's use. Feel free to what follows as the basis for your own group's conversation around this helpful book. 1. Why does the author think it's important to not read the book of Daniel as an adventure story or a prophecy manual? Do you agree or disagree? Why? 2. What does Osborne think we will get out of following his reading of Daniel? Why is that important for us in 2015? 3. What was the perspective Daniel had that allowed him to not complain, whine, or give in to despair? How can we gain that perspective today ourselves? Why is it hard to do? 4. How bad did Daniel have it in Babylon? Does this relativize our sufferings in America today? How does comparing the two cultures help you to live a godly life in 2015? 5. Why does the author build this chapter around the idea that "A father disciplines his own kids, not someone else's" ? How does he show that this idea is biblical? How and why does this often confuse us? 6. What are the "three classes that no one wants to take?" Do you still want to read the rest of this book? 7. What are your biggest "takeaways" from reading this section? What do you hope to learn going forward? 1. Why does our faith need to be tested? What does the Bible teach about this concept? - "When I say that suffering is necessary, I'm not minimizing the fact that i can be awful and devastating" (pg. 62). - "But notice that the purpose of Job's trials was not to see how much it would take to break him. It was to confirm and display the depth of righteousness that God knew Job already had" (pg. 62). - "By the way, it's not our job to determine if the faith of others is genuine or fake" (pg. 63). - "Make no mistake. God's childern mess up big-time and often. But there is one thing they don't do. They don't quit. They can't. God lives in them. And God never quits" (pg. 65). 3. Why can't good intentions, morality, fast starts be trusted? What are the key points the author is making in this chapter? 4. How does the author qualify his arguments? What is good about good intentions, morality and fast starts? 5. 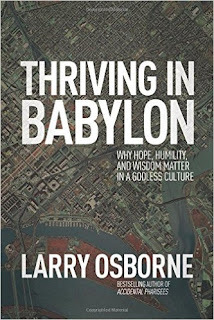 Larry Osborne says that he pities Christ-followers who have never really suffered. Do you agree or disagree with him? Why? 6. Discuss the importance of obedience, perspective, endurance, confidence, and courage. How can we develop these spiritual qualities in our own lives? Which of these qualities have you been challenged by and/or growing in recently? 7. What are your biggest takeaways from this section? Even though it was about suffering, did you find it encouraging? What about it was helpful to you going into this next week? 1. What are the two definitions of "hope" that Osborne talks about? What are the differences between them? 2. How does Osborne say that we can build what he calls "biblical hope?" Have you seen the "dimmer-switch principle" at work in your life? 3. Why is Osborne an optimist no matter what the scoreboard says? Do you share his optimism? Why or why not? 4. Osborne says that it often boils down to the question, "Who are we going to believe?" What are some of the common lies that our enemies--the world, the flesh, and the devil--want us to buy? How does the example of Abraham at the binding of Isaac, the "gates of Hades," of Matthew 16, and the cryptic book of Revelation help us counter those lies with faith? 5. Have you ever done the "cold-turkey" experiment Osborne describes on pages 109-110? If not, why not? If so, what were the results? 6. Read Philippians 4:8-9. What kinds of things do you do to fill your mind with the right stuff? 7. What is the problem with Christians catastraphizing and buying into conspiracy theories? How do we avoid them, especially while we live in a dangerous world where conspiracies may be real and catastrophes will come? 8. What does Osborne mean by "spiritual myopia" and "spiritual amnesia?" How have you seen them operating in your heart? Why don't we realize we have a problem? 9. Why are we tempted to put our hope in politics and bandwagons? 10. What is your biggest take-away from this week's discussion? What are you planning to do differently because we've read the book and met tonight? 1. Why is humility a forgotten (or even disdained) virtue? 2. What is (and isn't) biblical humility? How do we cultivate it? 3. Osborne writes, "When we take the path of serving others, we end at the place where God's favor and blessing reside" (pg. 150). Where have you seen this principle played out in real life? How did it play out in Daniel's life? 4. What lessons can we draw from Sarah's story (pgs. 153-155)? What's the difference between Sarah's approach to respect and Daniel's? 5. Re-read Jeremiah 27:9-11, 1 Peter 2:13-17, and Romans 13:1 (pgs 157-158 in Thriving) then respond to Osborne's observations about what he sees among many Christians today: "There's a marked absence of Daniel-like honor and respect toward godless leaders and a great deal of ridicule, contempt, bitterness, and even hatred. It's no wonder we keep losing influence. We're building up walls instead of tearing them down" (pg. 158). Do you think Osborne sees things correctly? What would you add to the discussion? 6. Is there ever a time for harsh words for godless leaders (think of John the Baptist's or Jesus' words to King Herod)? What principles would guide us if we are called to similar confrontations with leaders? 7. What is the problem Osborne identifies with seeing "everything through the lens of spiritual warfare?" How do we develop and maintain a "persuasion paradigm?" (re-read 2 Timothy 2:24-26). 8. Who wins? What are the benefits of a persuasion paradigm (re-read Jeremiah 29:4-7)? 9. What is your biggest take-away from this week's discussion? What are you planning to do differently because we've read the book and met tonight? 1. What is the "power of perspective" (pg. 169-171)? Why is it so important? 2. Osborne points out that Daniel had the ability to recognize which "hills to die on" and where to "draw his lines in the sand." How did he exhibit discernment in these areas and how can we learn from his example? - "Call Me What You Want" (pg 172). - "Teach Me What You Want" (pg. 172-173). 4. What does Osborne mean by a "scaredy-cat Christian?" 5. In what ways have you given in to legalism in the past? What helped you out of it? 6. In what ways have you been illegitimately afraid of spiritual contamination? How do you counter it in your life? 7. When is compromise bad, and when is it acceptable or good? Which Bible stories in this chapter where the most helpful to you in understanding a good kind of compromise? 8. Why is it more important to be faithful than to be successful? Where does the Bible teach this? Why is that hard to accept, and why is it good news at the same time? 9. What is your biggest take-away from this whole book? What are you planning to do differently because we've read worked our way through it? Thanks for this brother. Might do this myself. You're welcome! I'm glad so many people are using it. Hope it helps. [Matt's Messages] "Striving for Unity (Part Two)"
[Matt's Messages] "Striving for Unity (Part One)"
[Matt's Messages] "Returning to Romans"
[Matt's Messages] "Sent on a Mission in 2016"